There’s no doubt about it. Everyone wants to have happy, healthy teeth. Unfortunately many of us get caught up in the grind of daily life and it kind of falls by the wayside. It’s understandable, of course. Between eight (or more!) hours at work every day, keeping your house clean, getting groceries, running errands, taking care of the kids, and doing chores it can be hard to find time for yourself. And let’s be honest, when you do get a bit of free time all you want to do is zone out with some Netflix. The good news is that taking good care of your teeth is even easier than you’re making it out to be. As a matter of fact if you can follow the three simple rules in today’s posts then you’ll be well prepared for pretty much anything when it comes to your oral health. Sure, things can pop up and cavities can be discovered when you least expect it, but if you can carve out a few minutes a day and make it a point to make these tasks into habits then you’ll be heading in the right direction. Wondering how to take great care of your teeth? Keep reading to learn more! We’ll be the first to say that we get it. If you’re anything like most people then brushing your teeth in the morning is no problem. As a matter of fact, it’s something of a relief to get the smell of morning breath out of your mouth first thing. And, let’s be honest, you just can’t roll into work in the morning with dragon breath (you know, because you sit so close to your coworkers and they’re going to pick up on that kind of thing even if they’re too nice to say anything). Either way, the morning’s covered. It’s the nighttime brushing that can be hard. You laid down on the couch and got good and sleepy. Now you have to go upstairs and brush your teeth for two minutes instead of just jumping in bed and drifting off to dreamland? 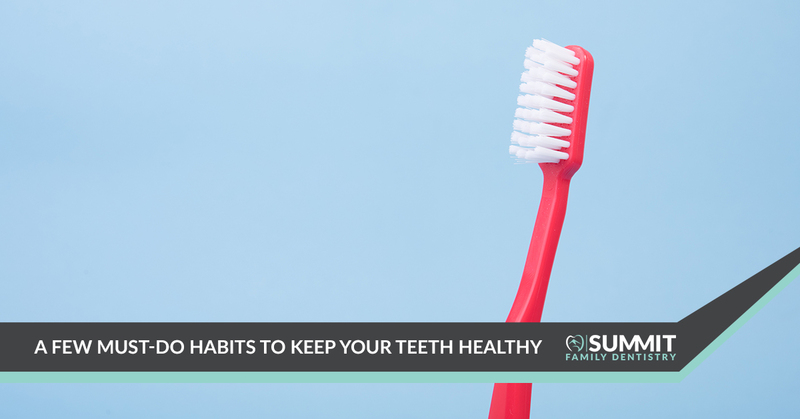 The truth though is that if you can brush your teeth for two minutes in the morning and two minutes in the evening you’ll be doing yourself a big favor when it comes to your oral health. No one wants to floss. The reality is that many of us think things like, “Oh, I’ll just floss extra good tomorrow.” When tomorrow rolls around we tell ourselves the same thing. Believe it or not, there’s probably not a single person in existence who actually believes that they’re flossing often enough. Now our goal is certainly not to guilt you into flossing, but would you believe that it’s one of the best things you can do for your teeth and gums? It’s true. And the good news is that even if you don’t particularly care for flossing because it’s an annoyance, at least it’s not as much of an annoyance as the keto diet that you’re trying. In other words, if you can manage to carve out some time to floss once a day you’ll be ahead of the curve. Just do your best to stop putting it off until tomorrow, because John Fogerty said it best himself–”someday never comes.” When it comes to flossing, just make “someday” today. Bet you never thought you’d hear about Creedence Clearwater Revival and flossing in the same sentence! Ready for the easiest oral health tip you’ll ever get? Just drink more water. Yes, your work provides you with coffee and soda aplenty, but those things aren’t doing your teeth any favors. We’re certainly not saying that you need to ditch them once and for all, but if you can replace them with water occasionally you’ll be off to a good start. As you might already know, most tap water is treated with fluoride which is great for your teeth. There are a number of other benefits to drinking more water, but the one we’ll focus on is how much of an impact it can have on your teeth. Even taking a few big drinks of water after you’re done eating can help to keep things from building up in your mouth, so that’s a win/win. The more water you drink, the more saliva your body produces, and the more saliva your body produces the less harm the sugars in your mouth can do. In addition to these habits we also recommend seeing us twice a year. Whether you’re new to the area and need a dentist in Denver, NC or you just realized it’s time for a checkup, we’ll be there to help. Contact us today to schedule an appointment. We look forward to hearing from you!